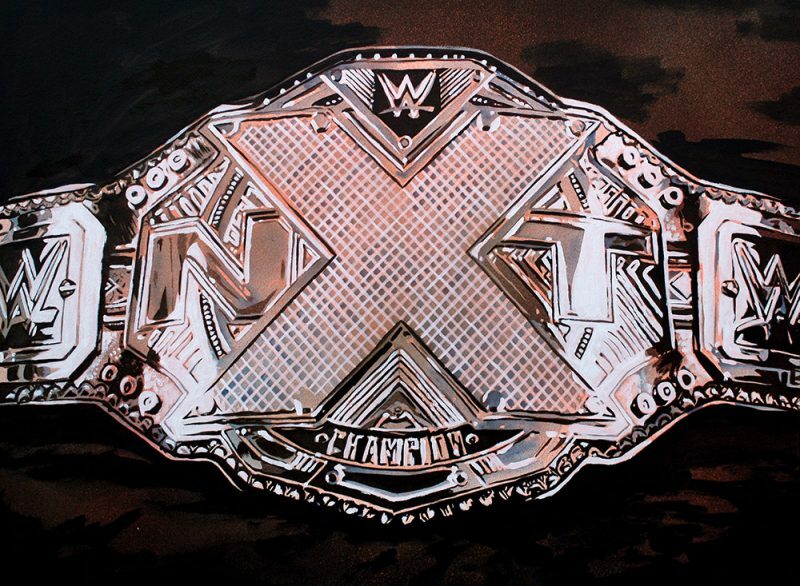 This painting of the NXT Championship is pretty straight-forward, but it’s because I wanted to really get across what a work of art the title already is. Sometimes it’s better to just let the thing breathe and not try to get in the way of the beauty. Funnily enough, I’d decided to do this particular championship before really looking at it. I didn’t realize the criss-crossing in the ‘X’ element of it, which led me to have to change things up a bit. With the other pieces in the Championship Series, when it comes to the highlights I’ve just done white acrylic paint. But that would have been too thick for all of those fine lines so I instead used some liquid acrylic paint. It’s not as opaque, but it allows for more control. I think that lack of opacity actually helped that area not overwhelm and instead balance the overall composition. ← Older: Eddie Guerrero Viva La Raza!